Having spoken to many different people at the recent ENG Remarketing conference, discussions typically centred around the many challenges our industry is facing. Finding new homes for used diesel cars after legislation changes designed to improve air quality, and meeting home market demand for used cars were just two frequently discussed issues. I am a firm believer that the remarketing sector is very resilient, and its supply chain partners are highly innovative in helping asset owners to resolve these challenges. 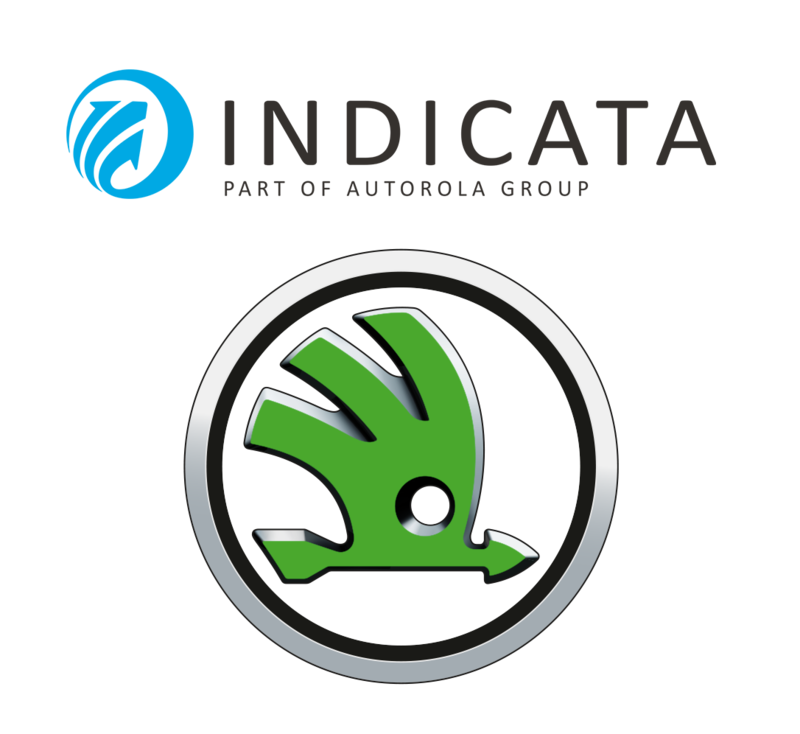 Our INDICATA real time used vehicle management portal is just one example of the innovative solutions available. It gives you market insights into not only what used cars are in demand in your area, but it also lets dealers know what prices are being charged. This big data insight is proving highly valuable in helping increase used car sales, reduce stocking days and importantly assist the dealer in buying stock they know is in high demand currently in their territory. OEMs can quickly use INDICATA to get a network-wide view of used car sales performance and leasing companies can get a real feel for the true value of their assets coming back into the market. Our Autorola Solutions proposition is also responding well to these market challenges. We were proud to present our case study with Santander Consumer Bank AG Germany at the recent ENG Remarketing conference on how we have worked with them to digitise their remarketing processes. The extra control they now have over all elements of their fleet management has helped tighten processes and gives a level of transparency that the bank requires to meet ever growing compliance legislation. Following a recent INDICATA strategy session in Italy with many Autorola country managers the message from Autorola Group CEO Peter Grøftehauge was clear in that more vehicle asset owners are realising that the best decisions are those that involve big data. With INDICATA in particular more dealers, OEMs and leasing companies are using its market insights to make real time decisions into what used cars to dispose of, down which channels and at what prices. In mainland Europe this data is vital in helping set reserves on unwanted home country stock such as diesels to ensure the cars are priced competitively when they hit the export market. Understanding quickly which countries will welcome different types and specifications of cars is going to be vital in getting cars sold quickly and efficiently. In countries like Belgium dealers and leasing companies have seen a major increase in stocking days as diesel demand reduces, which is why working with our country teams and having access to INDICATA data enables them to make more informed decisions more quickly. The latest version of INDICATA is processing 100,000 used cars per hour and further new features are planned for 2019 which will support asset owners in making the right decision using real time information. 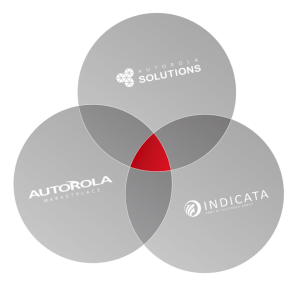 For OEMs Peter sees INDICATA being a powerful tool in helping them support their own dealer networks as used cars becoming an even more important part of their profitability. “With the growth in online new car sales set to continue and the popularity of EVs over the coming years likely to increase, which require less servicing, used cars will become even more important for the franchised dealer network to help keep them running as viable, profitable businesses,” he said. “OEMs can use INDICATA to ensure any used ex-management and rental buy back cars fed into dealers are the right colour, specification, engine type, age and mileage. By using this insight, the OEM will have the cars in stock for less time as the network will be queueing up to buy them as they know they will sell quickly and for a good price. “Any asset owner making decisions without using big data could be dead in five years,” he added. The stock of used diesel cars in the UK during November was reasonably well balanced across all ages from 13 months old through to 72 months old but there is a significant stock issue for cars under 12 months old which varies by brand. Used diesel cars aged between two to four years are responsible for the bulk of online business to consumer (B2C) used car sales, with much of that stock coming from ex-fleet vehicles. However, by November dealers were sitting on 74 days of market days supply (MDS) of used diesel cars aged six-12 months old. These younger used diesel cars will all be fitted with the latest clean Euro-6 diesel engines and therefore should not be a problem for any car buyers wishing to use them in the emerging clean air zone (CAZs) regions springing up across the UK. They also meet the requirements for use in London’s Ultra Low Emission ZONE (ULEZ) but INDICATA data has already shown how the political and media spin in the UK is putting car buyers off both new and used diesel cars. Despite the rhetoric against diesel both sales and prices of online B2C used diesel cars are rising. Sales increased by 3.5% to 392,676 in Q4 2018 whilst prices were around 1.3% higher than a year earlier. But putting that into context, online B2C used petrol car sales grew by 19.3% to 461,996 in Q4 2018 whilst used petrol car prices shot up 6.0%. This means dealers may well have to consider how quickly and at what price they clear out these young used diesel cars before the market starts to take a downward turn. This issue is also not unique to the UK with other European countries having varying degrees of the same issue and with a variety of different brands. 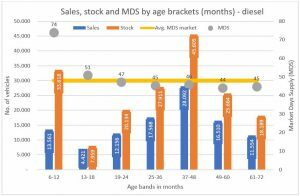 2018 ended with the usual rise in market days supply (MDS) as dealers increased their stock levels during the quiet year-end selling months, ready to kick start their new year sales push. MDS saw the sharpest rise in Germany as online business to consumer (B2C) used car sales fell sharply in Q4, down 7.3% over the previous quarter. There was an 11.1% quarterly fall in used diesel car sales and a drop of five per cent for used petrol car sales. Despite the fall in sales, dealers in Germany have been trying to manage their used car stock levels and are adjusting them for the increasing demand for petrol cars in the used market. At the end of December 2018 online stock of used diesel cars in Germany were 18% lower than the same period in 2017 whilst petrol vehicle stock levels were up 11.8%. At the end of 2018, year-on-year MDS fell in Germany (-2.4%), the UK (-6.3%) and Italy (-17.1%) which could be an indication dealers are worried about used car buying demand falling in 2019. 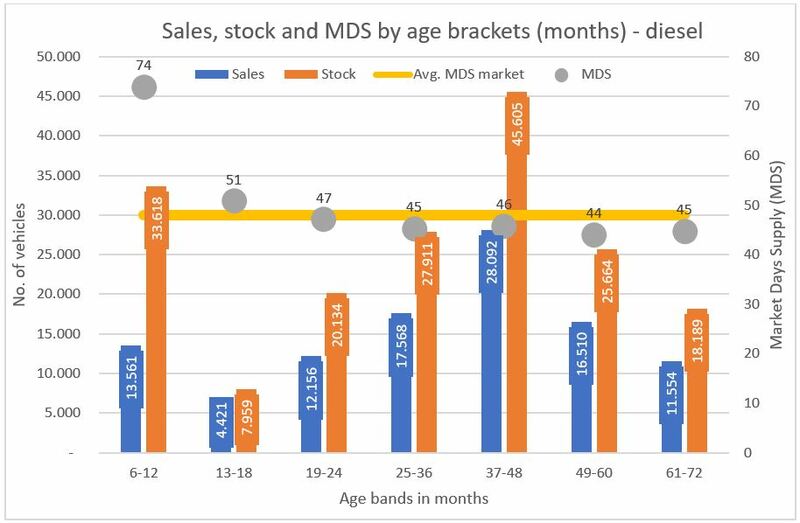 In contrast, MDS was 15.6% up in December 2018 year-on-year in Spain as demand switched from used cars into new cars leaving dealers with an excess of used stock, even though the stock of online B2C used cars in Spain was 18.2% lower by the year end. A deep dive into INDICATA’s data in the last newsletter revealed that the problem in Spain was being caused by diesel cars. 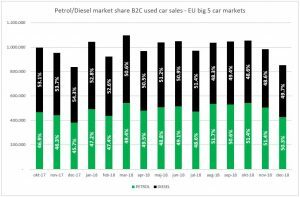 Dealers seem to have realised the change in market demand with the stock of online B2C used diesel cars at the end of the year down 21.1% year-on-year whilst petrol car stock levels fell by just 11.4%. MDS also rose in France, increasing by 6.8% for the whole used car market with petrol MDS rising by 8.1% in December 2018 compared to December 2017. 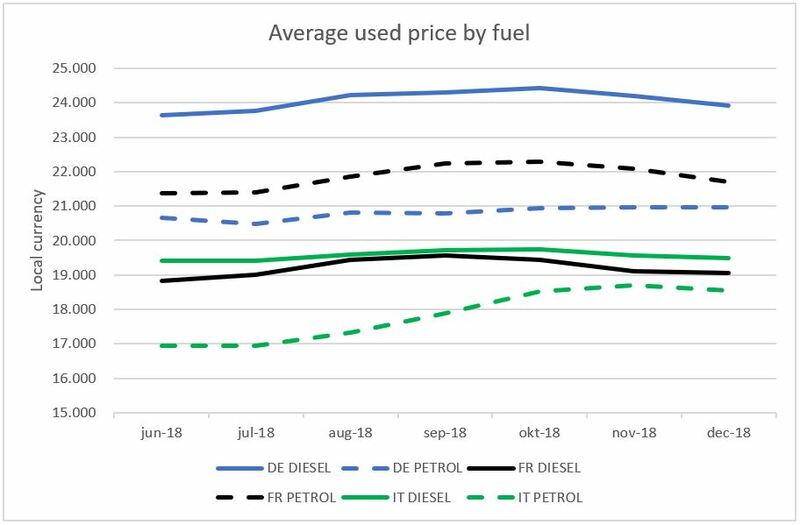 France has historically always been Europe’s strongest diesel market but used diesel car MDS hit a record 72.55 in December 2018 which is a third higher than the 54.31 MDS for petrol used cars – an indication of how much quicker French dealers are able to sell the relatively short supply of used petrol cars. According to INDICATA data, 2018 saw 12.2 million online business to consumer (B2C) used cars sales compared to just 11.2 million new car sales in Europe’s five largest car markets. This was heavily influenced by used car sales in the two largest markets of Germany and the UK where used car sales are running at a rate of 1.5 online B2C used cars for every one new car. 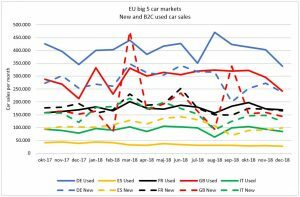 In France, Italy and Spain the new car sales continue to outperform the used car market despite the hiatus caused by Worldwide Harmonised Light Vehicle Test Procedure (WLTP) in the second half of the year. The 12.2 million used car sales was supported by a 3.8% increase in Q4 sales as total online B2C used car sales in the five countries topped 2.9 million in the last three months of the year. Demand for diesel continues to fall in Europe, with diesel marketshare dropping 4.6% by December 2018 compared to December 2017 for the big five markets combined. Four of the five markets saw diesel marketshare fall between 2017 and 2018 with Italy being the exception as online B2C used diesel car sales marginally increased marketshare by 0.6% to 68.5% of all used car sales. 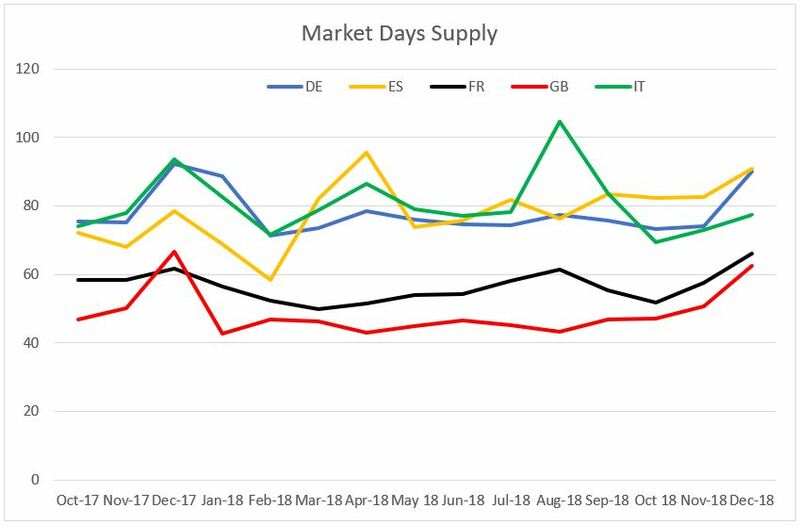 Whilst not instantly obvious from the chart due to the scale, not only is stock influencing market days supply (MDS) in Spain but so is used car sales. Online B2C used car sales in Spain were down 28.9% in December 2018 over the same month in 2017 with Q4 sales in 2018 down 30.5% over Q4 2017. The sharp decline in new diesel car sales is still not having a dramatic effect on the used car market according to the latest INDICATA data. Whilst used diesel cars now represent just under half of all online business to consumer (B2C) used car sales, compared to a 54.3% marketshare at the end of 2017, the rate of marketshare decline has slowed down and stabilised since August 2018. Quarter 4 2018 saw total online B2C used diesel car sales top 1.4 million across all five markets compared to 1.5 million for Q4 2017 but, after a two per cent fall from Q4 2017 to Q1 2018, diesel marketshare fell at a rate of just one per cent for the three remaining quarters with December seeing a slight increase in diesel marketshare. Despite diesel marketshare in the online B2C sales market falling in four of the five major European markets it is still the most popular in three of them. In Spain 71.3% of online B2C used car sales in December were diesel according to INDICATA data. Italian diesel cars took 68.5% of the December market, whilst in France used diesel cars accounted for 65.1% of the online B2C used car market. Online B2C used diesel car’s absolute volumes are also falling in some markets. Total sales for Q4 2018 were down by 17.2% in Germany compared to Q4 2017 and 32.1% down over the same period in Spain. However, the other three countries all saw total diesel car sales volumes in the online B2C market increase between Q4 2017 and Q4 2018. Italy saw an additional 15,690 diesel cars sold, an increase of 7.2%; whilst the UK saw a 3.5% increase, equating to an extra 13,113 units; and France sales rose by 2.7% to 335,087 online B2C used diesel car sales in Q4 2018. Diesel cars are continuing to be priced, on average, at a premium in the German market according to the analysis from INDICATA. This comes despite online business to consumer (B2C) used diesel car sales seeing marketshare erode in favour of petrol cars and total sales falling in absolute terms. 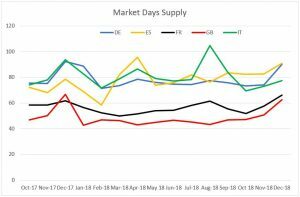 Whilst market day supply (MDS) for diesel cars was higher than for petrol in Germany for the first half of 2018 dealers seemed to take steps to change it with used diesel cars running at an average 2.2 days lower than petrol cars from June to December 2018. But diesel prices in Germany have started to ease back and are now at their lowest level since July 2018. Meanwhile, average online B2C used petrol car prices have been steadily increasing and by December 2018 were at a 12-month high of €20,972. In Italy demand for diesel remains strong with used diesel car sales still well ahead of used petrol cars but it is in online B2C used petrol cars where prices are rising the fastest. MDS in Italy saw used diesel cars hit 80.39 days in December 2018 compared to just 72.24 days for petrol. This was a key factor in the increase in used petrol prices and also resulted in the premium for diesel reducing to €950 by the end of 2018. 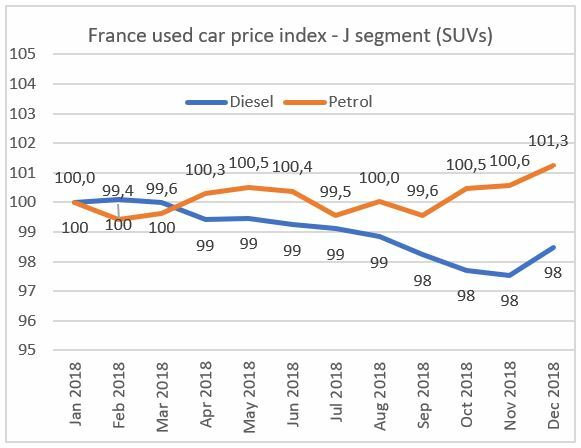 The used car market in France may still be dominated by used diesel cars but the gap between the MDS of petrol cars (54.31 days) compared to diesel cars (72.55 days) shows that the market is changing. With such a difference in MDS it is not surprising that the average online B2C used petrol car prices are now showing a premium over used diesel cars. 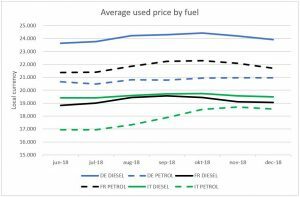 Even in the J-segment, which is the term used by INDICATA for SUVs, INDICATA’s price index shows that average online B2C used diesel car prices have fallen in 2018 whilst used petrol car prices have risen. 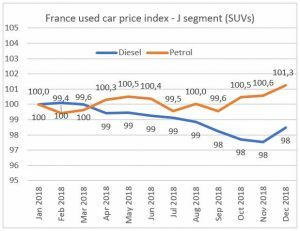 The Paris ban on pre-2005 diesel cars entering the city, along with the proposed 2024 ban on all diesel cars is the perfect example of why we are seeing such a strong increase in the price of used petrol cars in France and why this shows little sign of changing anytime soon. Santander Consumer Bank AG Germany has implemented the Autorola Fleet Solutions asset management platform to proactively manage its remarketing processes. By implementing its highly agile IT platform Autorola has enabled Santander to shape its remarketing workflows to the bank’s specific current and future needs. The ‘low-code’ Fleet Monitor platform enables the implementation and utilisation of process steps or changes within days, without requiring the time or assistance of system developers. This digitalisation has led to a reduction in remarketing lead times and access to more detailed data which enables smarter and faster decision making. It has enabled Santander Consumer Bank Germany to take control and proactively drive its remarketing management in real-time. Santander has unprecedented amounts of its own data as well as from its supply chain. Solutions ensures each activity is tracked, traced and analysed 24/7 which brings new levels of transparency to meet the growing demands for compliance within the banking sector. 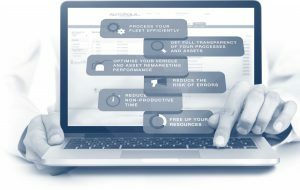 The real-time process management goes as far as instant messaging, where users participate in Fleet Chat, and live alerts, where potential SLA violations are instantly brought to Santander’s attention. This proactively avoids delays and potential cost management issues. The latest development for Autorola Solutions is the integration of the INDICATA a real-time used car market intelligence portal into Fleet Monitor. Its job is to provide valuable insights into used market prices and supply/demand dynamics to proactively help Santander define the most effective disposal channel for individual vehicles or bulk vehicles. Norway is leading the way when it comes to the transition to electric vehicles with the highest concentration of plug-in-vehicles across Europe and sales continuing to rise. However, a lack of demand in the used market is highlighting some of the challenges this ‘new’ sector faces. Here, Peter Grøftehauge, CEO, Autorola Group reports. 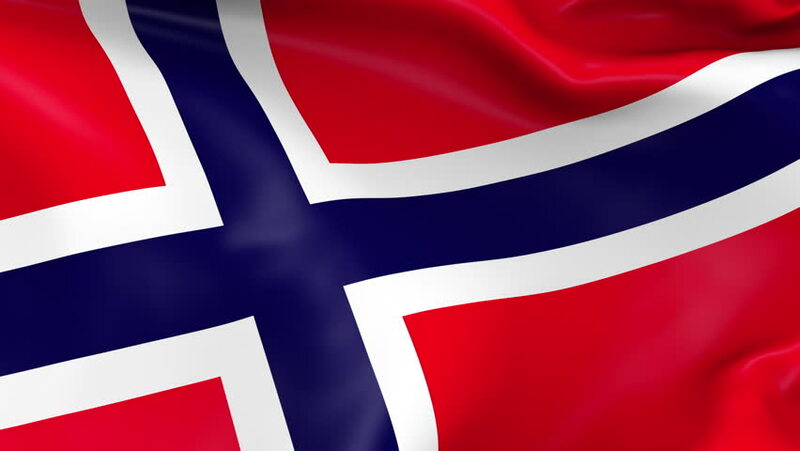 Norway has the most developed EV market in Europe, if not the world and in 2018 31.2% of the 147,929 new cars sold were EVs according to data from the independent Norwegian Road Federation (OFV). The Nissan LEAF is the best-selling car of any kind in Norway followed by the BMW i3 and the Tesla Model X, with a reported 30,000 pre-orders for the new Tesla Model 3 this growth is likely to continue. However, whilst this is good news as the Norwegian government aims to achieve 100% zero emissions new car sales by 2025, a key challenge which Autorola is supporting the market with is the management of the used cars when they come back from lease. Although demand for EVs is very high across the board, it is proving challenging to resell used EVs when lease options on new vehicles appear so appealing. ‘At present, used EVs are priced too high for the market conditions,’ explained Peter Grøftehauge, CEO, Autorola Group who also points to two out of three best-selling EVs in the country being premium segment vehicles. A key aspect of this oversupply in the used market is centred around ‘trust’ relating to the uncertainty still surrounding long-term product reliability beyond the length of a vehicle’s manufacturer warranty along with challenges around infrastructure. A consumer survey by Norsk Elbilforening also indicated that consumers have less confidence in Norway’s political ability to maintain a predictable EV-policy. One area some vendors are exploring is the opportunity of exporting used EVs, however this is also presenting challenges as there are currently no obvious markets where demand necessitates imports within Europe or further afield. ‘Norway is in a very interesting position and is a real case study for the EV sector. Adoption of the technology has been world leading, in many ways thanks to the associated infrastructure and government incentives, but the rest of the market is finding it a challenge to keep pace,’ said Peter.